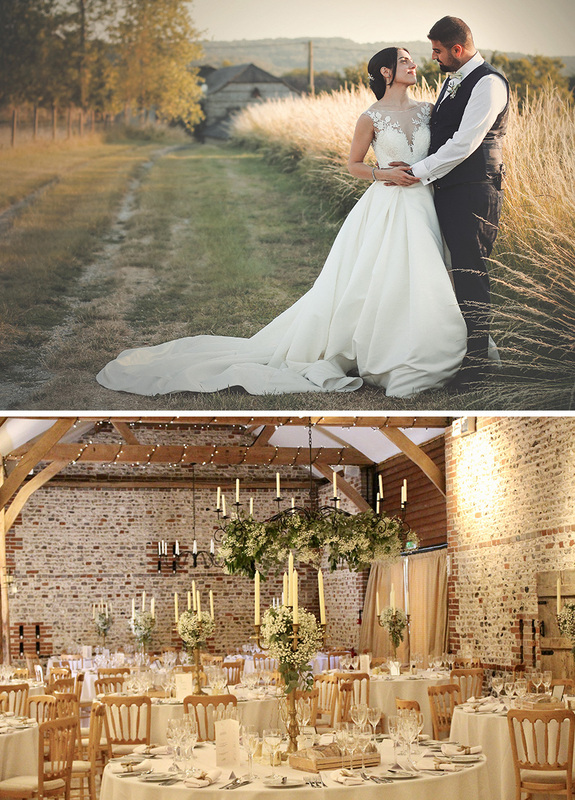 Noora and Nashwan set a July date for their countryside wedding at Upwaltham Barns. With an elegant, delicate colour scheme, seasonal food and flowers, it was a glorious summer celebration. 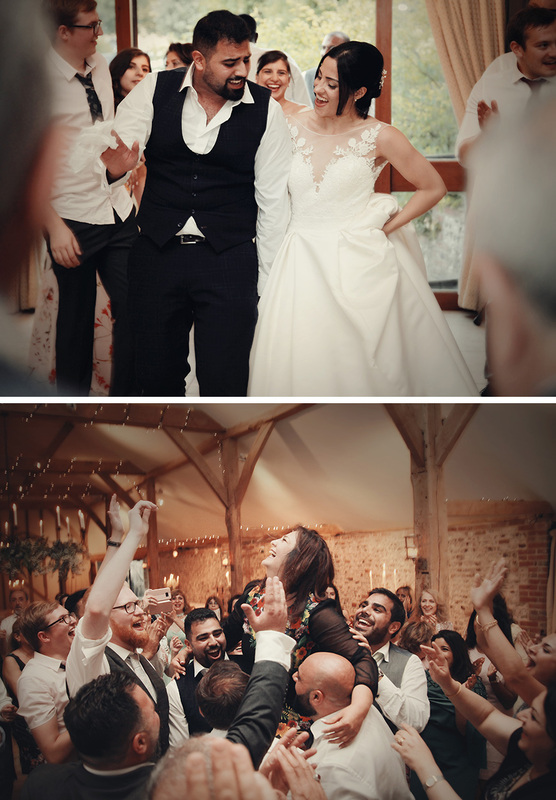 On the look out for their perfect barn wedding venue in the West Sussex countryside, Noora and Nashwan fell in love with Upwaltham Barns. Deciding on a July wedding date, the happy couple chose a magical theme akin to a Midsummer Night’s Dream. With a delicate sage, gold and ivory colour scheme, white flowers sat alongside beautiful foliage and gold candelabra. Keeping the décor minimal and letting the barn speak for itself, an abundance of foliage was interspersed with sprays of white roses and gypsophila. Noora’s bouquet reflected the same style, a beautiful arrangement of peach and white roses with eucalyptus leaves and gypsophila, while the bridesmaids carried gypsophila posies. Noora was stunning in an A-line satin and lace Mori Lee gown from Aurora Bride in Cheam. She completed the look with a diamond bracelet, pearl earrings, classic ivory stilettos and an elegant, long veil. Nashwan wore a tailored blue checked suit from Astares in Havant with waistcoat and sage bow-tie. Finally, a vintage 50s style dress in a beautiful shade of green was chosen for Noora’s two bridesmaids. Following their romantic ceremony in The East Barn, the newlyweds and their guests enjoyed drinks and canapés before moving in to dine. Caterers Nibbles2Nosh served a seasonal menu, starting with individual sun-blush tomato and mozzarella tarts and moving on to a choice of lamb shank or roast breast of chicken. “We loved the menu choices we made,” smiles Noora. A stunning four-tier cake created by Gemma at Tartufi featured one gold layer. As the sun set, a DJ played both English and Arabic / Kurdish music, delighting the guests and filling the dance floor. Noora and Nashwan took to the floor for their first dance, ‘Have I Told You Lately that I Love You’ by Van Morrison.